Welcome to the South African Business Coalition on Health and Aids. Having broadened our mandate to include all matters relating to health, but with a focus on workplace health, we aim to use our website as a quality repository of the latest workplace wellness trends and case studies. We encourage you the reader to contribute to the website by sending us information on how you, or the organization you work for has improved the quality of wellness within a workplace. For more on our vision, mission and strategy, please read the Strategy Document. Read more. Our Mission is to be simultaneously acknowledged and empowered by business to respond effectively and proactively to workplace and community wellness challenges. SABCOHA’s strategy has been based upon ten years of experience in systems strengthening, project management, and monitoring and evaluation. For more information of what we achieved between 2004 and 2012, please read the Flagship Report.Read More. As part of SABCOHA’s diversification, and expansion, the Community Fund was launched in March 2013. 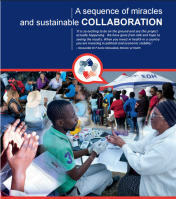 Through partnerships with donors, and with service providers, SABCOHA tested over 45 000 people in 2012. In partnership with EOH Health, the National Religious Association for Social Development and the Global Fund to Fight TB, Aids and Malaria, SABCOHA presents to you a case study on how effective PPP’s can work.Read More. Linked to Governments HIV Counselling and Testing Programme, SABCOHA established Bizwell in 2011. In order to measure and monitor more effectively, HIV and wellness information needs to have a central repository where anonymous and unlinked data can be stored. The development of a body of data that is valuable for research purposes. With funding from USAID, and through the University Research Company, SABCOHA has commenced a programme to capacitate small and medium size companies in the eradication of TB from the workplace. We have inserted the latest presentations from breakfasts held in cities around South Africa. It is estimated that there are approximately 150 000 trained peer educators in companies around South Africa as a part of workplace programmes established to assist in the response to HIV and AIDS. While much of their work takes place in the work setting, peer educators are also important resources to their communities where they provide support, advice and information. 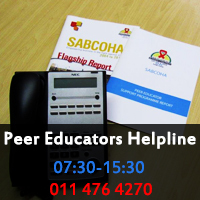 Given their important role, SABCOHA has identified the need for peer educators to be supported in order for them to contribute effectively and efficiently over the long term. Read More…. The NRASD Health programme is an attempt to respond to the specific challenges in South Africa in a dynamic way – by cooperating with different sectors (religious, NGOs, Business, Government). These challenges can only be met through the formation of smart partnerships, that combine different kinds of expertise, experience and networks. Through these combinations, together we can improve efficiency and the impact of health programmes. The challenge to ensure quality healthcare for all citizens of South Africa, lies in finding a balance between a predominantly biomedical approach, where there is a focus is upon treatment, versus the focus upon addressing socio-economic factors such as poverty, lifestyle and human behaviour. By combining financially efficient systems to ensure accountability and “value for investment”, but at the same time build ‘caring networks of trust’, will lead to the protection and dignity of vulnerable citizens.